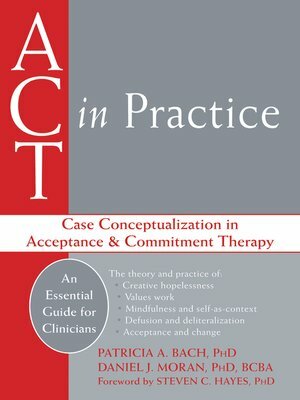 Acceptance and commitment therapy (ACT) is more than just a set of techniques for structuring psychotherapeutic treatment; it also offers a new, insightful, transdiagnostic approach to case conceptualization and to mental health in general. Learn to put this popular new psychotherapeutic model to work in your practice with this book, the first guide that explains how to do case conceptualization within an ACT framework. ACT in Practice offers an introduction to ACT, an overview of its impact, and a brief introduction to the six core processes of ACT treatment—the six points of the hexaflex model and its pathological alter ego, the so-called inflexahex. It describes how to accomplish case conceptualizations in general and offers précis of the literature that establish the importance and value of case conceptualization. This guide also offers possible alternative case conceptualization for cases from different therapeutic traditions, a great help to therapists who come from a more traditional CBT background. Exercises throughout help you to evaluate the information you have just learned so that you may effectively integrate ACT into your practice.